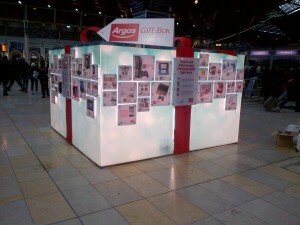 After its weather-sensitive outdoor advertising campaign, Argos continues its effort of reaching consumers outside their homes with an interactive QR-code purchase pop-up store. The magic box is to be found in London at Paddington and Waterloo rail stations this week, allowing commuters to buy presents by simply pointing their smartphones at the gift and scanning its corresponding QR code. Once purchased, the item is can be collected the same day from the nearest Argos store. This experiential campaign could be likened to Tesco‘s and P&G’s – Mall.cz who have virtual stores in subway stations in Seoul and Prague. “Following Kinetic research early this year that showed a huge increase in the recognition of mobile technologies in the UK, it’s great for Argos to break new ground with this Out of Home and mCommerce campaign. For mentioning all those involved in the project we name Concourse Initiative, experts in promotional sales and sponsorship solutions. “Following Kinetic research early this year that showed a huge increase in the recognition of mobile technologies in the UK, it’s great for Argos to break new ground with this Out of Home and mCommerce campaign” said Brunton, Account Executive at Kinetic. Kinetic is traditionally an Out of Home media agency and in addition today delivers wide-ranging specialist expertise through its complementary service divisions such as Joule, Aviator or Traget Health. Kinetic employs over 800 professionals across 38 offices. This entry was posted in News by Dynamax. Bookmark the permalink.